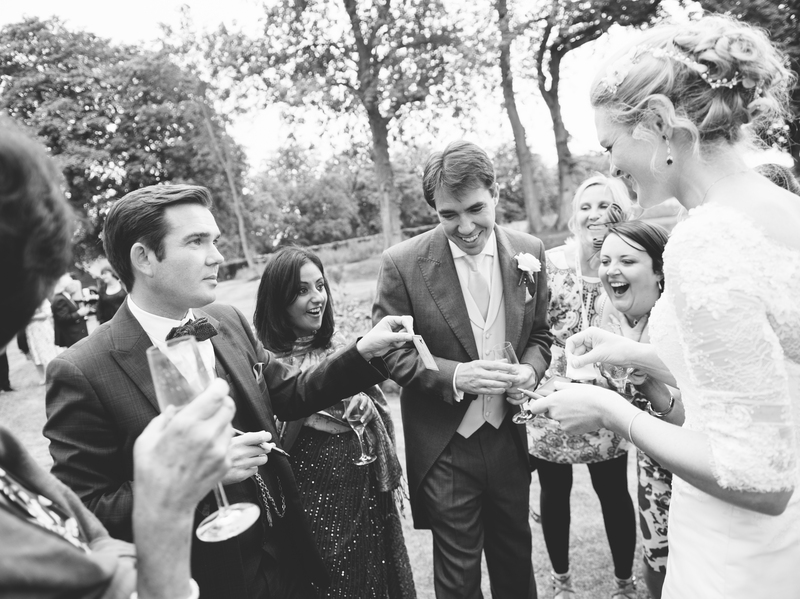 Looking to Hire a Magician in London? 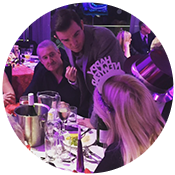 London magician and mind reader Edward Crawford is based in South London, and has been performing as a close up magician and as a stage show/cabaret magician throughout London for the past 15 years. During this time he has performed in some of London’s most prestigious locations, including Buckingham Palace, Mansion House, The Tower of London, and the Ritz hotel. 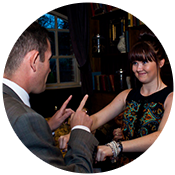 He is currently one of the most sought after London Magicians and private entertainers in the UK. If you need to hire a London magician please contact Edward for a quote or for further information. 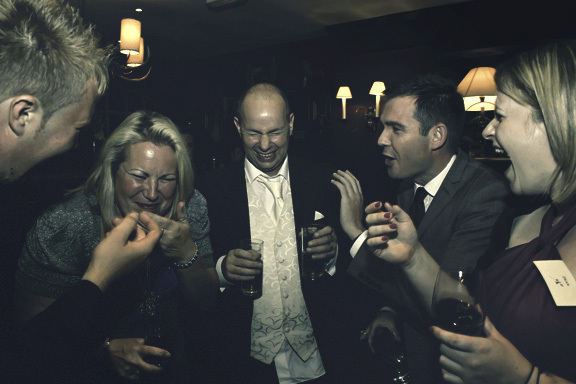 Edward’s act is perfect for corporate events, banquets, dinners, balls, private parties, and weddings, throughout London and offers your guests a truly unique and memorable experience. 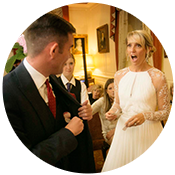 Whether you require a London Magician for a close up performance at a dinner or drinks reception, or a cabaret /stage show, Edward will tailor his act to suit your event. Edward’s style of magic is a lot more than card tricks, (although he does at time use cards), and bunnies from hats, and general tricks better suited to children. Edward performs a genre of magic known as mentalism, best described as magic of the mind, or even Jedi mind tricks! This is the closest thing to real magic you will ever witness. In a typical show Edward will read thoughts that would be impossible for him to know, control the future, influence the present and at times he will demonstrate telekinesis (moving objects with his mind). No camera trickery or stooges, like you might, rightfully, suspect when you see a TV magician. All this and more will happen directly in front of you. 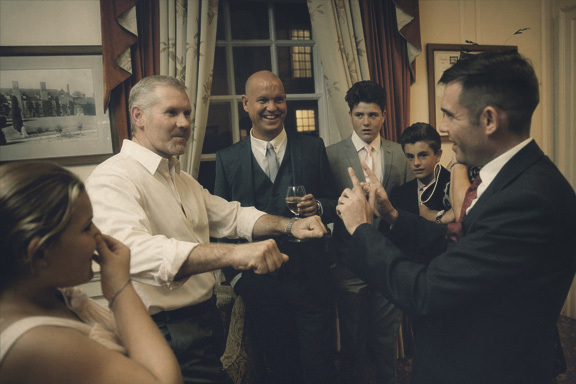 No matter what your requirements may be, London magician Edward Crawford’s act will guarantee your guests a truly unique and memorable experience. Each performance is suited to the client’s needs and it can be assured that your guests will be amazed, amused and astonished. If you would like to book him for your event in London simply fill in the enquiry form below. The entries below are blogs from my old website. Over the years I have amassed a few thousand entries which I am unable to transfer directly to the new blog on this site. It will take a while (probably years the rate I’m working) but I am going to transfer the old blog entries onto this site placing the entries on the relevant pages. Below you will find details of old shows I have performed throughout London over the years. Hopefully these may be of interest and give people details of the types of shows I perform and give a few ideas of the performance that may be best suited to your event. Last week I had the pleasure to perform close up magic at a wedding reception at London Kitchen Wall in the city of London. The wedding was a very international event, made up of mainly Italians with a few Japanese, Slovakian and English guests. Thankfully Everyone spoke perfect English as whilst I can speak a little Italian performing in Japanese is something I’ve yet to try! When reading minds it does help to be able to speak the same language as the person I am performing for, where I think English may be an issue I usually simplify things and ask them to think of or at times to draw a picture which I will try to reproduce. A massive thank you to Raffaella and Paolo for the booking and if you are looking to hire a magician in London please get in touch to find out what I can offer. A large proportion of my work is for large corporate companies. Last week I performed at an annual event for Holiday Inn at their Old Street branch at an event for their staff members. 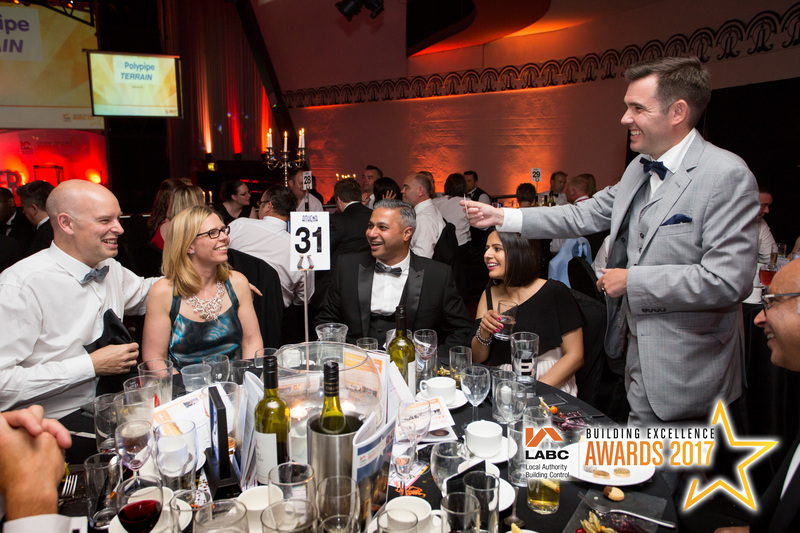 They required a close up magician in London to perform at tables whilst the staff and guests ate prior to an awards ceremony to thank staff members for their service. It was a buffet meal which meant some people were eating whilst others waiting for food so I took this opportunity to perform for the guests who were yet to eat. This meant I could perform throughout the entire meal without having to stop and start as courses were served. A large proportion of the guests were from abroad and a few had very little English (although there was a genuine cockney amongst them, a true rarity in the East End of London these days). I chose to perform a number of more visual routines for the foreign guests so language barriers wouldn’t be an issue. At the end of the day I performed a special routine on the senior managers in attendance as a a show piece which all the other guests got to watch. 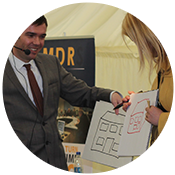 Close up magic is perfect at this type of event as it helps to bring together guests who have previously never met and gives them a topic to discuss. A big thank you to Holiday Inn for the booking, I look forward to seeing you all at the next one. If you require a close up magician or a corporate magician in London contact Edward on 07814 135569 or email for more details. Last night I was booked to perform close up magic at a 30th birthday party at the Jugged Hair bar and restaurant in London. I had been recommended to the client by one of her friends who had seen me performing in Soho back on Valentines day so a big thank you to Anna for the recommendation and the kind words, very much appreciated. The client required me to perform for a couple of hours at the beginning of the evening as her guests, friends and family arrived for a drinks reception prior to sitting down to eat. It was for a group of about 40 people which is always a nice amount to work for as it means I get the opportunity to spend a lot of time with each group and give them a really in depth performance. I started the evening with a few warm ups, a favourite starter for me is to tell people their pin numbers although some people find this a little unnerving! Once I got my eye in I proceeded to mix and mingle with the guests reading minds, duplicating drawings were particularly popular with people coming up to me asking for another go and bending metal with my mind. At the end of the evening when everyone sat down to eat I ended my performance with a show piece performing a routine for the birthday girl and her boyfriend. This was performed for the entire group as a show type piece. This led to requests for an encore so I stayed for another 30 minutes performing a few more routines until I really had to get on to the next booking of the day. It was a fantastic evening and I want to thank Rachel for the booking. Look forward to seeing you again. 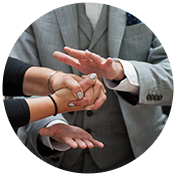 If you want top hire a London magician whether for close up, a dinner show, or stage show for a private party, wedding or corporate event contact Edward to discuss your event. A massive thank you to Swiss RE for the booking, look forward to seeing you all again. If you’re after a London magician whether for a close up show, parlour show or stage show please get in touch to discuss details. Last night I performed at The Royal Hospital Chelsea, home of the Chelsea Pensioners. The event was a showcase for the Royal Hospital to demonstrate to potential bookers the fantastic venue. They had a number of entertainers throughout the night although it was undoubtable the pensioners who joined us who were the highlight of the evening, taking full advantage of the free bar. I spent the evening mixing and mingling with the guests performing close up magic, mind reading and psychological magic in the stunning great hall. There were a couple of hundred people there so I only had about 5 minutes with each group (10 minutes is probably my preference). I performed two routines with each group generally starting with a routine involving influence and then moved onto mind reading. I also performed some telekinesis, moving objects with the mind. This involved bending metal such as keys and coins, I would ask people to take coins out of their pockets and watch them bend in their hands! I had a fantastic evening and managed to pick up a couple of further bookings for next year. 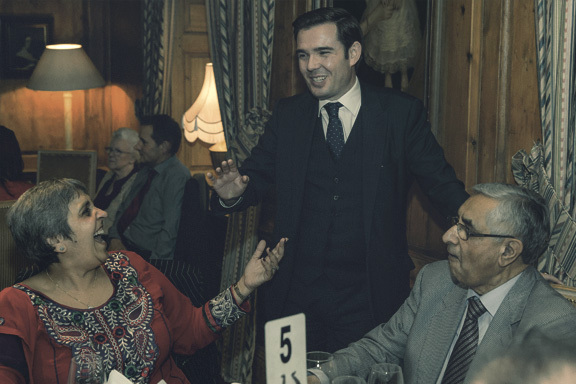 It was a real pleasure to perform for the pensioners and I look forward to going back soon to perform more and have a drink with them in their club. A massive thank you to Jo and everyone at the events team, it really was one of the best organised events I have performed at. I look forward to seeing you all again soon. On Thursday evening I was booked by Virtus Contracts to perform at their annual art exhibition they put on for their architects and clients, the event took place at Tanner Warehouse, Bermondsey. They required a close up magician to mix and mingle with their guests as they viewed the art work and ate and drank. I was booked for 3 hours and I performed for approximately one hundred people throughout the evening. The event was a very relaxed, casual affair with people arriving after they had finished work, grabbing a few drinks and chatting, mingling and networking. Throughout the evening I mixed with small groups of people, usually 3 to 5 people at a time. As a general rule when I perform close up at events of this nature when I join a group after introducing myself I will explain what it is I do and the nature of my psychological magic and mind reading. Then I’ll get into the performance, I’ll start with a quick warm up to see who in the group would be best to work with. This usually entails predicting the way people will behave or think. A simple example; I may write something down then ask someone to name a playing card. The card they name will be the same as what I wrote down. I often do the same with numbers, i.e write something down, ask a person to name a number between 1 and 100, they name the same number as I wrote down. Once this is out of the way I moved into the main part of my close up performance. As there were quite a lot of people to see in quite a short space of time last night I kept things simple and performed a number of mind reading routines, I asked people to think of names of old friends it would be impossible for anyone else to know, I then described the friends and told them the names they were thinking of. I also asked people to draw pictures I then duplicated their drawings. In the final hour a number of people asked to see something else…….at this point I attempted a little telekinesis, moving objects with the mind! I asked people to remove change from their pockets. As they held the coins I made them bend in their hands! I ended the evening on a final routine for a number of employees of Virtus, demonstrating the empathy between two people, causing them to act in the same way despite having their eyes closed and not knowing what the other was doing. This is a very strange routine and needs to be seen to be believed. I managed to pick up a couple more bookings for later in the year from this event which was fantastic. All in all it was superb evening and I had a lot of fun performing for everyone. A big thank you to everyone at Virtus for the booking. I look forward to seeing you all again. If you’re after a close up magician in London for a corporate event please contact me on 07814 135569 or email for more details. Christmas is always my busiest time of the year. Often performing two or three shows a day from late November through to early January. Last night I performed at the Haymarket Hotel, London for the Christmas party of Quayle Munro, a London Based investment company. The event was for 45 people who would be having a sit down Christmas dinner. I started the evening performing some close up magic as people arrived for a drinks reception. This gave me an opportunity to chat and meet people and get an idea who would be the best candidates for the show I was to perform later. Throughout the meal I performed my dinner show. This is like my stage show but performed on a much smaller scale, designed so it can be performed anywhere with out too much preparation and space required. I performed the show in two acts of 20 minutes each, the first act as they sat down and the second act between the started and the main course. I would always recommend starting early for events like this as people do have a tendency to drink a fair bit and a show can be hard to perform later in the evening! The show involved influence, psychological deception and mind reading, ending in a display of empathy between the CEO and the lady who booked me, basically I taught them how to read minds much to the astonishment of the audience. It was a fantastic evening with a really lovely group of people in beautiful surroundings. A big thank you to everyone at the Haymarket Hotel for all your help and an even bigger thank you to Emma and Quayle Munro for the booking. I look forward to seeing you all again at the next event we discussed. If you are a London Magician for your Christmas party or any other event please get in touch to discuss your event and to get a quote. I was hired to perform close up magic and mind reading during dinner for 60 people. The event was for employees of The Royal Bank of Canada and was held at Cafe Du Marche, London. The guests were sitting on 4 large tables so I gave each table their own private show. 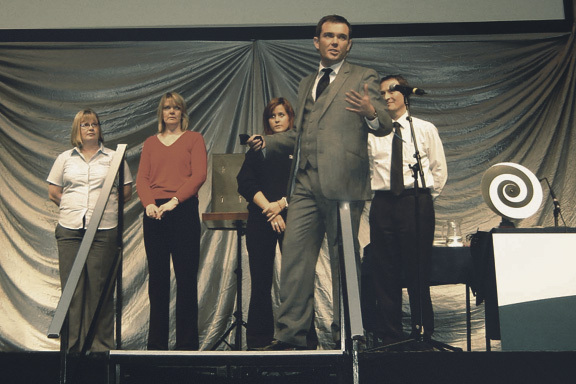 Each table received about 3 separate performances using individuals from each table to assist in feats of mind reading and psychological illusion. Some routines used just one person others between 5 to ten people. In this way I could assure that nearly everyone got to be involved in at least one routine. I’ll always ensure that I don’t perform for people whilst they are eating at dinners of this nature so whilst certain tables were being served food I would be performing on the other tables that were still waiting. It’s always fun being able to go back to tables a few times as it gives me a chance to get to know people and discover who the best people will be to work with, therefore I could give a final performance on each table with an ultimate piece of mind reading using a perfect candidate, literally reading their thoughts! The whole afternoon was a lot of fun, the perfect Christmas party. Thanks to Royal Bank of Canada for the booking and to the Cafe Du Marche for being so accommodating. 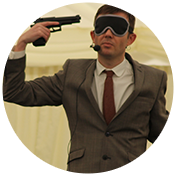 If you’re after a London Christmas magician please get in touch to discuss your event. On Thursday night I was hired by Fulham Football Club to perform at their end of season party for their stadium and team staff. The event took place at Craven cottage (the home of Fulham). The event had a fun fair theme and I was asked to mix and mingle with the 100 or so guests performing close up magic and mind reading. I was originally hired to perform for 2 hours but ended up staying for about 3 and a half hours as it was such a fun evening (I later regretted it when I remembered I had to drive 3 hours to Somerset that night to be ready for a tradeshow performance the following day!). Throughout the evening I performed for small groups of 2 to 5 people at a time. Some people were seated, others standing. This does make a difference to the routines I perform. If people are seated I can utilize the table they are seated at, if they are standing everything has to take place in peoples hands. My favourite routine of the night was a new one I have been working on. I handed a number of guests solid metal nails, they were asked to test their strength and found to be quite solid. Using a combination of mild hypnosis and influence I managed to get a number of people into such a strong state of focus that they could physically bend the nails in the hands. This works on the same concept as the storied you hear of someone lifting a car when in a state of emergency and a loved one is trapped in side. This is the first time I have performed this routine and it was an absolute joy to see it work so successfully. It was a fantastic evening with a really lovely group of people. I look forward to seeing them all again, hopefully to celebrate their rise to the premiership. Edward was fantastic! He arrived early to prepare and instantly wowed the General Manager and the Events Managers with his magic. He was professional, entertaining, engaging and had everybody stumped! Brilliant addition to any event, big or small. Two weeks later and people are still raving about Edward’s tricks. Thank you!!! !